This innovative tool reproduces the fretboard relief for an instant localized fret leveling with the strings on. No need to straighten the neck or remove the strings for leveling. 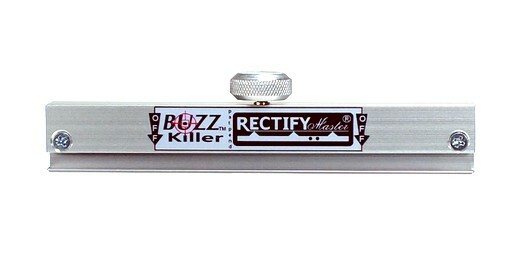 With BUZZ Killer you can fix buzz very quickly. You won't need to stop playing! You can refinish the frets later, if not strictly necessary like on an average shop-repair. BUZZ Killer does not need string lifter to operate. Its base features a sequence of abrasive and protective zones that will scrape only the buzzing frets. 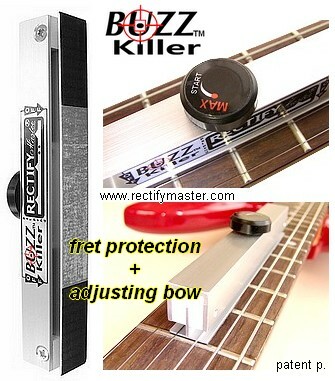 Simply place the base of the tool on the frets in an area adjacent to the buzz and adjust the tool sothat the surface of the base comes in contact with all of the frets below. Then, place the tool in the buzzing area and level it. It works as a kind of "copy and paste" which replaces the bad working part of a fretboard with the nearby good working one. And the buzz disappears. Manual on site contains detailed text and tutorial video (Your user name and password are included in the package). It comes preloaded with #320 grit abrasive plus a little roll for recharge or reshape the fret edges. Optional Kit for reloading and refinishing. It includes LittleBone all in one fret file. To buy it with the tool it's plus: $35.